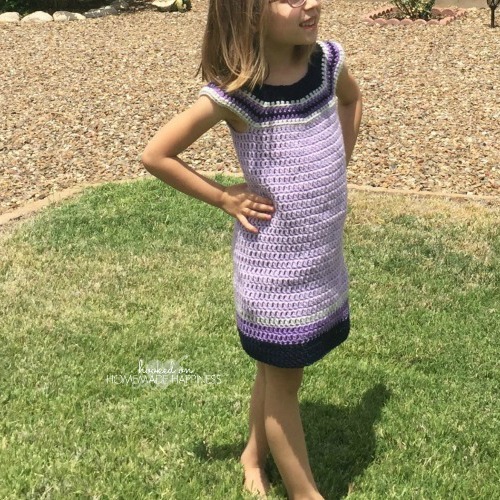 This Pretty in Purple Crochet Dress Pattern is so easy and a great beginner pattern. 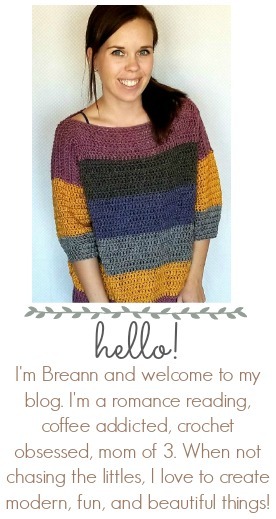 Only basic crochet stitches are used: single crochet, half double and double. That’s it! … really, any level crocheter can make one of these. Plus, it’s just too adorable! This dress fits my 5 year old, but it could be easily adjusted. You could change the size of your yarn, or change the hook size. You can also change the starting chain number. I would keep your starting chain a multiple of 5 + 2, then the increases in each round should work accordingly with your number. I love the keyhole back closure with the pretty button. It adds some fanciness to this summery sun dress. Fasten off and weave in your ends. Sew a button to the top, opposite of the button hole created. And you’re done! The little girl in your life now has the cutest dress for summer! What an adorable dress! Perfect for summer! What size does this pretty in purple dress fit?